Itâ€™s only March 2019 but there have already been no fewer than 10 students protests at campuses around South Africa just this year. 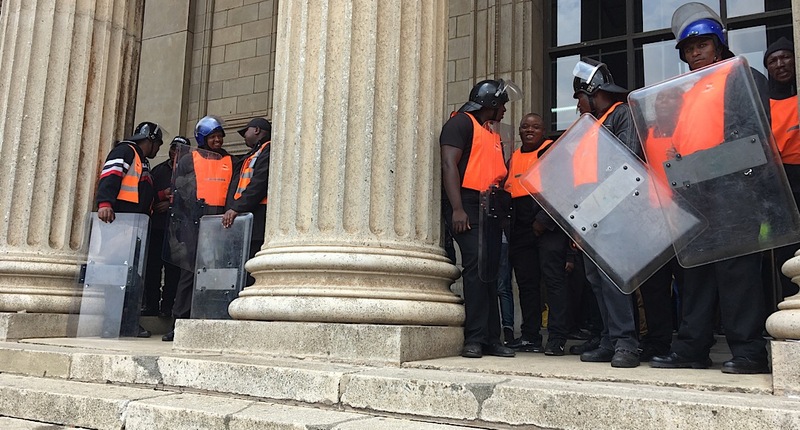 Violence is once more normalised on campuses with a student killed during the 2019 protests. The issues at the heart of the protests have varied but all point to one bigger issue: the failures of former president Jacob Zumaâ€™s Free Education Plan. FATIMA MOOSA reports. It was 16 December 2017 and former president Jacob Zuma was on his way out as the president of the African National Congress (ANC). His final act was to announce his free education plan as a supposed legacy of his tenure. He announced many changes to the free education sector including increasing government subsidies for universities and technical and vocational educational training (TVET) institutions. The announcement was the introduction of fully subsidised free higher education and training for poor and working class South African undergraduate students. Even at the time of the announcement concerns were expressed. From students to analysts and even Zumaâ€™s own ministers the plan was questioned. The plan was scarce on detail of where the government would get the money to fund this project while the other issues of the Fees Must Fall (FMF) movement were not addressed. The finance minister then, Malusi Gigaba, had the job during the 2018 national budget of finding the money to fund Zumaâ€™s plan. By the time he gave the speech in February 2018, several universities had already felt the fallout from the Free Education plan through recurring student protests. What wasnâ€™t mentioned in the speech and was buried in the budget documents was the budget cuts made to other education programmes in the medium term, including goods and services. Itâ€™s the cuts made to other higher education programmes which played a big role in the resulting student protests. From the beginning of 2018 up until now, various universities have shut down through protests. In May 2018, students at Unilim disrupted the university. The protests were over the lack of accommodation and the distribution of Nsfas. Students protested over the delays in getting their Nsfas allowances. The university at the time said Nsfas hadnâ€™t sent them the final list of approved students so that they could distribute the money. Univen students shut down their campuses over delays in Nsfas funding as well in 2018. Students at the time alleged that the university received the Nsfas money from government but failed to distribute it. In 2019, students once more protested. This time it was over accommodation amongst other issues. The SRC said the primary issues were outstanding allowances, registration of postgraduate students and historic debt. In February 2019, MUT shut down in response to the call by SRC leadership. The university was shut down over unpaid Nsfas allowances and unregistered students.Â At both MUT and UKZN the student protests have been plagued with factional fights between the Econmic Freedom Fighters Student Command (EFFSC) and the South African Students Congress (Sasco). Each party has blamed the other for violence that broke out during protests. The EFFSC-led SRC in 2018 held an accommodation is land march. This was over the lack of sufficient accommodation for students. They marched to the office of Johannesburg mayor Herman Mashaba demanding better accommodation for students. These protests continued in 2019 when the SRC held a hunger strike to protest registration backlogs and the lack of accommodation. Students were met with violence from private security. Nsfas – already burdened – was faced with even greater challenges in the rolling out of free education. Their system is not unable to cope with the dual systems they have to run. They have to give out regular grants to students and grant free education to students. Free education has meant more students were allowed to register at universities. Yet there is simply no space for all students. Government and universities didnâ€™t make provisions for more accomodation. At many universities, final-year and postgraduate students were being pushed out to make space for incoming first years. This led to more and more students being forced to find accomodation in libraries and bathrooms. Historic debt keeps coming up as an effect of the free education plan. While â€œpoor and working classâ€ first-year students were addressed in the plan, the missing middle so to speak were not. The government donâ€™t have plans to scrap it leaving the doors of universities closed for many. Students are struggling with debt from previous years of studies with the free education plan seemingly not caring about them at all. Postgraduate students were not addressed at all in the free education plan. Added to this was financial challenges that the National Research Foundation (NFR) are facing. It is becoming much more difficult for postgraduate students to fund themself. Issues like accomodation affects postgraduate students who are being pushed out to make way for first years. The free education plan burdened many sectors of higher education least of the university. Universities – while not faultless during protests – are left to figure out the kinks in the plan without a lot of support. Whether itâ€™s the accommodation issue, historic debt or Nsfas payments, universities are overwhelmed. During the UKZN protests, the management said they just do not have any available resources to deal with the studentsâ€™ issues. While the 2018-present cycle of student protests around the country canâ€™t be labelled as part of Fees Must Fall, they present many similarities. The main one being students are putting their bodies on the line to protest. Instead of proper attention given to what they are protesting, they are being labelled as violent and irrational. Their issues remain unanswered with no foreseeable resolutions.